Vancouver, British Columbia--(Newsfile Corp. - January 9, 2019) - SilverCrest Metals Inc. (TSXV: SIL) (NYSE American: SILV) ("SilverCrest" or the "Company") is pleased to announce further Phase III in-fill drill results for the Las Chispas Property (the "Property") located in Sonora, Mexico. 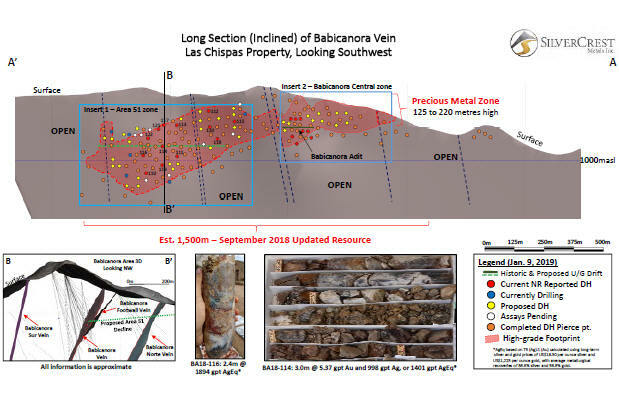 The current drill program is designed to increase resources through expansion drilling and improve confidence in the resource with closely spaced in-fill drilling in the Babicanora Vein. 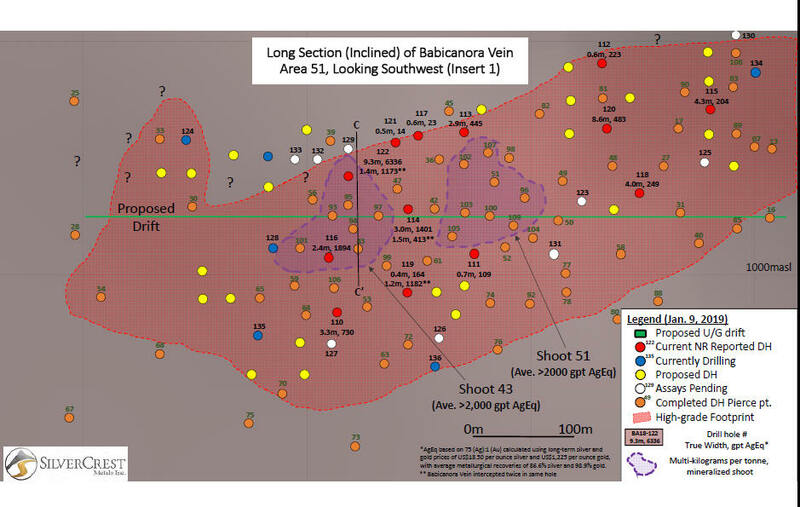 The 20 reported in-fill holes in this release were targeting mineralization in the high-grade Area 51 zone (13 holes), Babicanora Central zone (7 holes), and Babicanora Footwall ("FW") and Hangingwall ("HW") veins which were drilled while targeting other zones. Combined with the 19 in-fill drill results previously reported on November 1, 2018 and December 13, 2018, the in-fill drilling program has returned very positive results. A total of 39 in-fill holes have been completed with 28 holes in the Area 51 zone. The weighted average (true width, uncut, undiluted) of the 28 in-fill holes from Area 51 is 3.9 metres grading 11.36 gpt gold (or "Au") and 1,064.1 gpt silver (or "Ag"), or 1,915 gpt silver equivalent ("AgEq", based on assumptions defined in table below). For comparison, in the September 13, 2018 resource estimate, Area 51 had an estimated weighted average true width of 2.7 metres, grading 7.13 gpt gold and 614 gpt silver or 1,148 gpt AgEq. 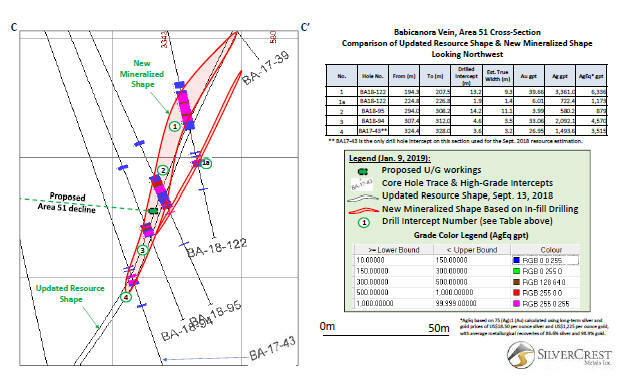 Hole BA18-122 intersected and expanded high-grade mineralization in Area 51's "Shoot 43" returning an impressive 9.3-metre wide intercept grading 6,336 gpt AgEq compared to previously modelled narrower mineralization in this area, which had averaged 3 metres in true width (see attached Figures). N. Eric Fier, CPG, P.Eng, and CEO, remarked, "Drill Hole BA18-122 is for the record books with 9.3 metres (true width) grading 6,336 gpt AgEq (84.5 gpt AuEq). 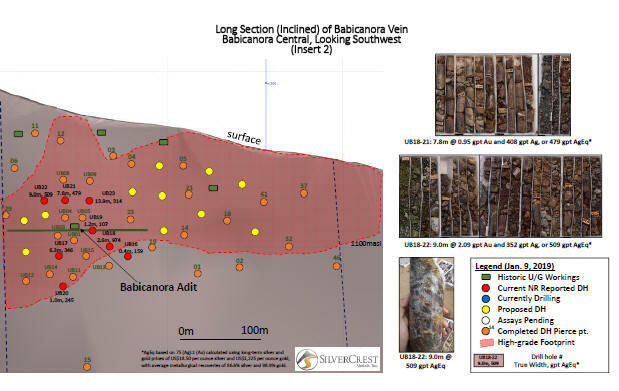 Further positive results from closely spaced in-fill drilling continue to confirm the continuity of high-grade mineralization in the Babicanora Vein, including Area 51 and Babicanora Central zones, as well as the Babicanora FW and HW veins. Additional drill holes in Area 51 are indicating wider mineralized thicknesses in several areas than previously modelled and are identifying discrete multi-kilogram per tonne silver equivalent mineralized shoots (Shoots 43 and 51). 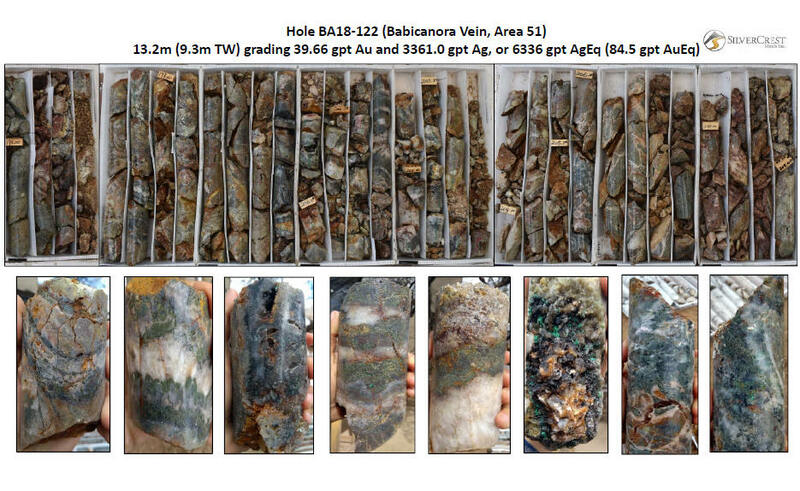 These additional core holes are critical to both in-fill confirmation and potential expansion of resources in the Babicanora veins. This is a great way to start the New Year as we continue to improve our confidence and add ounces in Area 51, hunt for new discoveries on the additional 22 known veins not in the September 2018 resource estimate, compile the new drill results for the next updated resource, and advance the Las Chispas Preliminary Economic Assessment." § UB signifies an underground core hole. BA is a surface core hole. ‡Drill intercept related to Babicanora Central zone was previously reported on November 1, 2018. All assays were completed by ALS Chemex in Hermosillo, Mexico, and North Vancouver, BC, Canada. 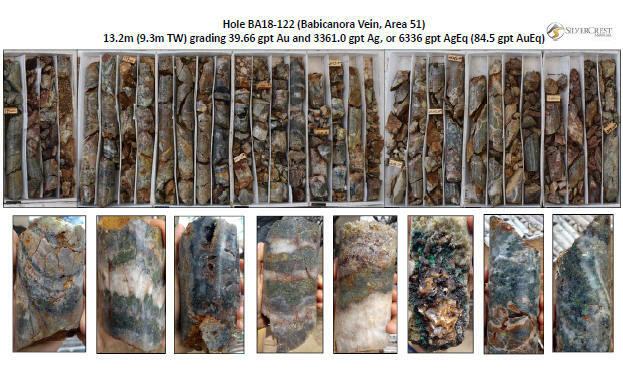 Holes BA18-111, BA18-117, and BA18-121 were below the Company's cutoff grade of 150 gpt AgEq within the Babicanora veins. 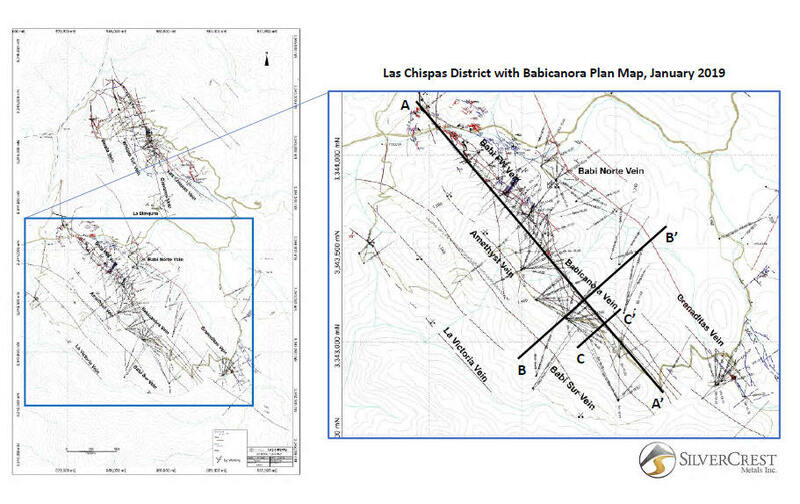 Holes BA18-117 and 121 are located at the top of the high-grade footprint with minimal impact on estimated resources. 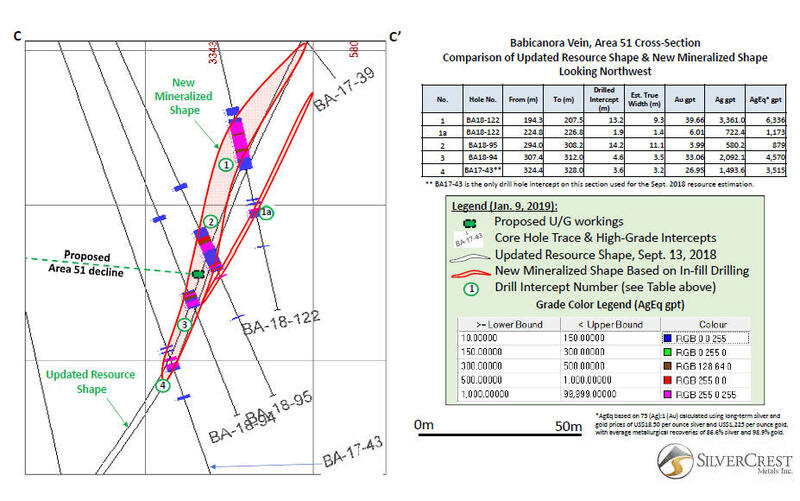 Hole BA18-111 is located in a previously define lower grade resource area (see attached Figures). Mineralization in Hole BA18-122 shows epithermal silica and sulfide textures, including colloform-banding, jigsaw, cockade and crustiform that are commonly found in an epithermal Precious Metal Zone. The highest-grade intervals in this hole are related to both primary (argentite) and secondary (acanthite and polybasite) silver sulfides, electrum and native gold. In-fill drill results for the northwest projection of the Babicanora Vein (Babicanora Central zone), Babicanora FW Vein and Babicanora HW Vein confirm estimated grade and width continuity as previously presented in the September 2018 resource estimate. The Company continues its Phase III exploration program with nine drills operating on site. Drills are focused on expanding mineralization for inclusion in the next updated resource estimate anticipated in Q1, 2019 and in-fill drilling (estimated 25 metre spacing) to reclassify Inferred Resources to Measured and Indicated. An additional 5,000 to 10,000 metres of drilling are planned for inclusion in the next updated resource. Other ongoing site work includes PEA study, ground breaking for the Area 51 decline, an extensive metallurgical test program, drilling large diameter wells for site water, and permitting for various additional work. This news release contains "forward-looking statements" within the meaning of Canadian securities legislation. These include, without limitation, statements with respect to: the strategic plans, timing and expectations for the Company's exploration, rehabilitation and drilling programs of the Las Chispas Property, including drilling test water wells, permitting for various work, and optimizing and updating the Company's resource model; information with respect to high grade areas and size of veins projected from underground sampling results and drilling results; and the accessibility of future mining at the Las Chispas Property. Such forward-looking statements or information are based on a number of assumptions, which may prove to be incorrect. Assumptions have been made regarding, among other things: the conditions in general economic and financial markets; availability of skilled labour; timing and amount of expenditures related to rehabilitation and drilling programs; and effects of regulation by governmental agencies. The actual results could differ materially from those anticipated in these forward-looking statements as a result of risk factors including: the timing and content of work programs; results of exploration activities; the interpretation of drilling results and other geological data; receipt, maintenance and security of permits and mineral property titles; environmental and other regulatory risks; project cost overruns or unanticipated costs and expenses; and general market and industry conditions. Forward-looking statements are based on the expectations and opinions of the Company's management on the date the statements are made. The assumptions used in the preparation of such statements, although considered reasonable at the time of preparation, may prove to be imprecise and, as such, readers are cautioned not to place undue reliance on these forward-looking statements, which speak only as of the date the statements were made. The Company undertakes no obligation to update or revise any forward-looking statements included in this news release if these beliefs, estimates and opinions or other circumstances should change, except as otherwise required by applicable law.